Everest Base Camp Trek by Mrs G.
With porters Kamal & Kumar on Kala Pattar with Everest behind. Photo by Mrs G.
The Everest Base Camp trek, October 2014, by Mrs G.
There are not enough superlatives which can adequately describe the experiences that made up this adventure - a trek to Everest Base Camp. The fascinating, colourful, noisy, cheerful chaos of Kathmandu for the couple of days before and after the trek, the thrilling flights to and from Lukla where it began at a height of 2,800 metres, and from there the great trek itself, 14 days of 7 – 9 hours increasingly arduous walking of about 100 miles altogether, reaching an altitude of just over 5,500 metres at Kala Pattar - high above Everest Base Camp - and taking us through some of the world's most spectacular, magnificent and truly awesome scenery. This Everest trek is billed as 'strenuous' and indeed it is; not particularly because of any technical difficulties on the paths, since for the most part we were using main routes of communication; rough, rocky paths with flights of uneven, irregularly spaced steps at the steepest points, heavily used by trekkers of all nationalities, porters and yak or mule trains. The challenge was having the stamina to keep going for 14 days, often doing the equivalent of a couple of Lakeland Fells per day, but at altitude above 2,500 meters it's common to experience headaches and nausea - symptoms of altitude sickness (AMS) - but luckily we didn't; lack of puff was the main problem! Gradual acclimatisation is recommended as one of the ways to avoid AMS along with drinking plenty of fluids. We probably drank 3 litres of tea every day, served up in battered, brightly decorated thermos flasks at breakfast, lunch, 4 o'clock and dinner – not forgetting the welcome cup of 'bed tea' brought to us every morning at 6am by our guide. Steady acclimatisation was built into our itinerary which gave us 10 days to reach the top and 4 to return to Lukla. The outward leg included a side trek up the beautiful valley towards Thame (where Sherpa Tenzing lived) and back down the next day. We spent two nights each at Namche Bazaar and Dingboche on the main route where far from having a rest day we were encouraged to 'walk high, sleep low' (the motto for good acclimatisation) so we were more than willing to comply. Our guide would take us on a day's walk to a point of interest some 2-300 metres higher than where we were staying, then we would sit in a sheltered spot in the sunshine and drink in the fabulous panoramas whilst he told us about the villages, features and mountains we could see, before leading us back down to base for a flask of the delicious Nepali black tea – actually quite pale in colour – and biscuits. Our accommodation was in tea houses sleeping in small, unheated twin rooms, typically panelled and floored with bare plywood, spartan but clean. Mostly there was a shared toilet at the end of the corridor but sometimes it was outside, so that night visits necessitated leaving your cosy bed and braving the minus temperatures to reach the facility! Once or twice we had the luxury of an 'en suite', one of which was very basic; it had no flush, but there was a large drum of icy water in the corner with a large tin can beside it with which we had to do the necessary manually. We slept in warm hooded sleeping bags with a cosy fleece liner and were also given an extra quilt above 4,000m when temperatures overnight would sink to minus 10C. From late afternoon everyone would congregate in the dining room, drawn like magnets to the cast iron stove in the middle of the room. These stoves are fuelled at higher altitudes by yak dung as there are no trees for firewood; it costs nothing, is available everywhere, dries out quickly (we saw them stuck on to wayside walls to dry after being flattened by hand into large 'pancakes' and stacked up in piles outside the buildings under tarpaulins, like turf in Ireland), ignites easily, doesn't smell and provides much welcome warmth. Huge kettles stand on top of the stove boiling up the water used for making tea and filling everyone's Nalgene bottles which double to provide a hot water bottle overnight then water for drinking on trek the next day. The route from Lukla first took us down a couple of hundred metres to the milky blue fast-flowing Dudh Khosi River and along its narrow high-sided fertile valley where every little available patch of soil is cultivated with strips of vegetables and cereals. We went through a succession of villages, crossing the river several times by means of narrow wobbly metal suspension bridges where you definitely need a good sense of balance and head for heights; if you look down through the swaying strips of the metal walkway you have a clear view of the roaring rocky torrent far below! The first really long gruelling climb took us up through coniferous forests (where we had our first exciting view of Everest!) to Namche, a bustling town nestling in a steep natural amphitheatre, a focal point for trekkers and locals alike, crammed with tea houses, cafés, shops selling local produce, souvenirs and everything a trekker could need. There's a twice-weekly market where locals come to buy and sell produce plus almost anything else that can be transported by porter or beast of burden, from heaps of freshly picked vegetables, fingers of bananas and pyramids of eggs to superglue, suspect 'genuine' branded goods and San Miguel beer. After Namche the route would often take us down to a valley bottom only for us to have to climb back up to regain that height and more on the other side. Our guide jokingly called these undulations 'Nepali flat'! Eventually though, the rhododendrons and other shrubs became more and more stunted and we rose above the tree line into remote high wide valleys beyond any permanent civilisation with the Himalayan giants towering above us, but never seemed threatening or claustrophobic. Maybe that was because of the weather; we had 14 days of sunshine with brilliant blue skies with a fantastic sharpness of outline and clarity of light. It will be a different story altogether when the clouds and storms close in and the rain or snow is whipped along by an icy wind. As we gained altitude and entered the world of the highest mountains on our planet, we constantly felt overawed by their jaw-dropping grandeur and magnificence with the dazzling splendour of the enormous glaciers and ice-falls up on the mountain sides lying between the sharply protruding rocky spurs of impossible steepness. It has to be said though that when the glaciers level out they are incredibly dirty, bearing all the muck and rubble that they have taken centuries to erode. We trudged laboriously up the terminal moraines of the Khumbu glacier and slowly made our way along its lateral moraines, through piles and piles of stones and rocks interspersed with randomly abandoned huge erratics or scattered pools of meltwater. The paths through here are much narrower, created originally by the first climbers heading for the original Everest Base Camp which nowadays is Gorak Shep (just over 5,000 metres) below Kala Pattar. When you encounter yaks on any path traversing the mountainside, but particularly here as it is so narrow, you have to make sure that you are on the uphill side; the yak stops for no-one and if you are in the way, it, or its load will nudge you aside. If you made the mistake of being on the downhill side with a vertiginous drop, your trek would come to an abrupt, possibly fatal end! One of the most beautiful mountains visible for many of the days of the trek is Ama Dablam, meaning 'mother's necklace'. The two ridges at either side of the soaring main mountain look like the protective arms of a mother 'Ama', and 'Dablam', the pendant worn by Sherpa women is the prominent lump of glacier near the highest point. Although considerably lower than Everest, this mountain is technically much more challenging and attracts climbers from all over the world. On one of our acclimatisation walks we saw such climbers in the tea house nearest the Ama Dablam Base Camp organising their equipment with their guides and porters. 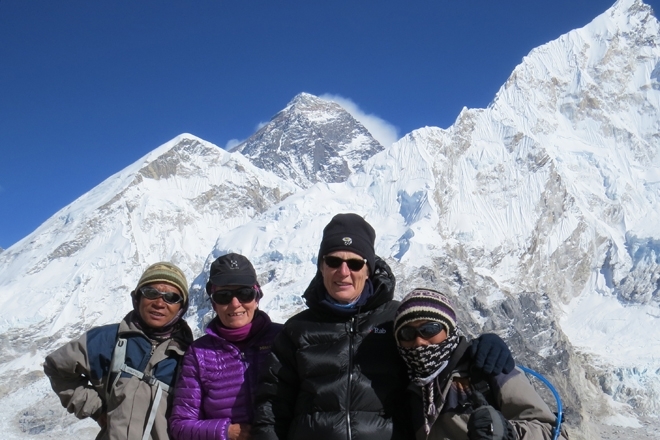 We had a fantastic Sherpa team consisting of our guide and two porters, always smiling and eager to help. Porters Kamal and Kumar, diminutive but wiry, carried our kitbags and all that was needed for the trek – up to 30kg each - by means of tying it all together with heavy duty binder twine and carrying the load thus created on their backs taking the weight via a broad canvas strap across their foreheads. Pemba was our excellent guide who looked after us all day long with infinite patience and good humour, from bringing us early morning tea to filling our Nalgene bottles at the end of the day and in between, guiding us along our route, telling us about the area, answering our endless questions and organising meals for us in the tea houses. He had a supply of packets of biscuits which he would produce from his rucksack at appropriate times, most memorably when we reached our goal – 5,540 metres high on Kala Pattar when he opened the Bourbon biscuits, and (being a devout Buddhist) placed the first one on a nearby shrine as an offering to the gods in recognition of having reached our goal. Kamal and Kumar were there too although they could have stayed behind at the tea house as they had done their job for the day of carrying the packs there. But they insisted on coming too to carry our rucksacks for us and to share in the moment; there was much photographing, hand-shaking and back-slapping! We all got on so well and it was a sad moment when we split up at the end of the trek. How can this Everest trekking experience be followed? It was a totally unique, once in a lifetime event, with daily adventure, stunning scenery, much laughter and great companionship. Further treks in Nepal will certainly take place and one is indeed already being planned to coincide with the rhododendrons in flower, but this particular visit has provided a host of wonderfully vivid memories and will never be forgotten. If you would like to follow in our client's footsteps you can take the classic Everest Base Camp Trek staying in tea houses like Mrs G, or stay in the best lodges en route on our Everest Base Camp in Style trekking holiday.